The Cassegrain reflector is a combination of a primary concave mirror and a secondary convex mirror, often used in optical telescopes and radio antennas, the main characteristic being that the optical path folds back onto itself, relative to the optical system's primary mirror entrance aperture. This design puts the focal point at a convenient location behind the primary mirror and the convex secondary adds a telephoto effect creating a much longer focal length in a mechanically short system. In a symmetrical Cassegrain both mirrors are aligned about the optical axis, and the primary mirror usually contains a hole in the centre thus permitting the light to reach an eyepiece, a camera, or an image sensor. Alternatively, as in many radio telescopes, the final focus may be in front of the primary. In an asymmetrical Cassegrain, the mirror(s) may be tilted to avoid obscuration of the primary or to avoid the need for a hole in the primary mirror (or both). The Cassegrain reflector is named after a published reflecting telescope design that appeared in the April 25, 1672 Journal des sçavans which has been attributed to Laurent Cassegrain. Similar designs using convex secondaries have been found in the Bonaventura Cavalieri's 1632 writings describing burning mirrors and Marin Mersenne's 1636 writings describing telescope designs. James Gregory's 1662 attempts to create a reflecting telescope included a Cassegrain configuration, judging by a convex secondary mirror found among his experiments. The Cassegrain design is also used in catadioptric systems. 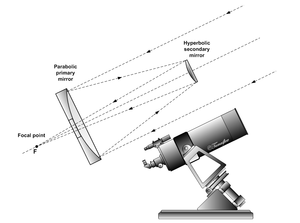 The "classic" Cassegrain has a parabolic primary mirror and a hyperbolic secondary mirror that reflects the light back down through a hole in the primary. Folding the optics makes this a compact design. On smaller telescopes, and camera lenses, the secondary is often mounted on an optically flat, optically clear glass plate that closes the telescope tube. This support eliminates the "star-shaped" diffraction effects caused by a straight-vaned support spider. The closed tube stays clean, and the primary is protected, at the cost of some loss of light-gathering power. In most Cassegrain systems, the secondary mirror blocks a central portion of the aperture. This ring-shaped entrance aperture significantly reduces a portion of the modulation transfer function (MTF) over a range of low spatial frequencies, compared to a full-aperture design such as a refractor or an offset Cassegrain. This MTF notch has the effect of lowering image contrast when imaging broad features. In addition the support for the secondary (the spider) may introduce diffraction spikes in images. is the distance between the two mirrors. The Ritchey-Chrétien is a specialized Cassegrain reflector which has two hyperbolic mirrors (instead of a parabolic primary). It is free of coma and spherical aberration at a flat focal plane, making it well suited for wide field and photographic observations. It was invented by George Willis Ritchey and Henri Chrétien in the early 1910s. This design is very common in large professional research telescopes, including the Hubble Space Telescope, Keck Telescopes and Very Large Telescope(VLT); it is also found in high-grade amateur telescopes. The Dall-Kirkham Cassegrain telescope's design was created by Horace Dall in 1928 and took on the name in an article published in Scientific American in 1930 following discussion between amateur astronomer Allan Kirkham and Albert G. Ingalls, the magazine's astronomy editor at the time. It uses a concave elliptical primary mirror and a convex spherical secondary. While this system is easier to polish than a classic Cassegrain or Ritchey-Chretien system, the off-axis coma is significantly worse, so the image degrades quickly off-axis. Because this is less noticeable at longer focal ratios, Dall-Kirkhams are seldom faster than f/15. An unusual variant of the Cassegrain is the Schiefspiegler telescope ("skewed" or "oblique reflector", also known as "kutter telescope" after its inventor Anton Kutter) which uses tilted mirrors to avoid the secondary mirror casting a shadow on the primary. However, while eliminating diffraction patterns this leads to several other aberrations that must be corrected. Several different off-axis configurations are used for radio antennas. Another off-axis, unobstructed design and variant of the cassegrain is the 'Yolo' reflector invented by Arthur Leonard. This design uses a spherical or parabolic primary and a mechanically warped spherical secondary to correct for off-axis induced astigmatism. When set up correctly the yolo can give uncompromising unobstructed views of planetary objects and non-wide field targets, with no lack of contrast or image quality caused by spherical aberration. The lack of obstruction also eliminates the diffraction associated with cassegrain and newtonian reflector astrophotography. Catadioptric Cassegrains use two mirrors, often with a spherical primary mirror to reduce cost, combined with refractive corrector element(s) to correct the resulting aberrations. The Schmidt-Cassegrain was developed from the wide-field Schmidt camera, although the Cassegrain configuration gives it a much narrower field of view. The first optical element is a Schmidt corrector plate. The plate is figured by placing a vacuum on one side, and grinding the exact correction required to correct the spherical aberration caused by the spherical primary mirror. Schmidt-Cassegrains are popular with amateur astronomers. An early Schmidt-Cassegrain camera was patented in 1946 by artist/architect/physicist Roger Hayward, with the film holder placed outside the telescope. The Maksutov-Cassegrain is a variation of the Maksutov telescope named after the Soviet/Russian optician and astronomer Dmitri Dmitrievich Maksutov. It starts with an optically transparent corrector lens that is a section of a hollow sphere. It has a spherical primary mirror, and a spherical secondary that in this application is usually a mirrored section of the corrector lens. In the Argunov-Cassegrain telescope all optics are spherical, and the classical Cassegrain secondary mirror is replaced by a sub-aperture corrector consisting of three air spaced lens elements. The element farthest from the primary mirror is a Mangin mirror, in which the element acts as a second surface mirror, having a reflective coating applied to the surface facing the sky. The Klevtsov-Cassegrain, like the Argunov-Cassegrain, uses a sub-aperture corrector. It consisting of a small meniscus lens and Mangin mirror as its "secondary mirror". Cassegrain designs are also utilized in satellite telecommunications earth station antennas and radio telescopes, ranging in size from 2.4 metres to 70 metres. The centrally located sub-reflector serves to focus radio frequency signals in a similar fashion to optical telescopes. An example of a cassegrain radio antenna is the 70-meter dish at JPL's Goldstone antenna complex. For this antenna, the final focus is in front of the primary, at the top of the pedestal protruding from the mirror. Wikimedia Commons has media related to Cassegrain telescopes. ^ "Diccionario de astronomía y geología. Las ciencias de la Tierra y del Espacio al alcance de todos. Cassegrain". AstroMía. ^ "THE EFFECTS OF APERTURE OBSTRUCTION".